It's Finished Object Friday and my 'FO' this week is a little swatch made from my first handspun. What a difference a week makes - last weekend I was desperately trying to get to grips with my drop spindle. After regular practice (of between 15 and 30 minutes most days) things are really starting to come together. It's pleasing to have made what feels like considerable progress this week and also to have received many lovely comments and messages from readers and social-media friends who are inspired to give it a try too. It would seem many of you did the same as me and quickly gave up on spinning after a brief unsuccesful attempt. There are really only two things to get to grips with... and I struggled with both of them at first. I hope thes links below will be useful to others beginning on their own journey - they are the videos that really made it 'click' for me. I don't know about mass distribution or rotational dynamics, but I did know that my spindle was wobbling around a lot and affecting my rhythm, in that I didn't have time to get into one before it would stop and change direction. Reading more about it, it seemed the problem was caused by my inexperienced winding of the 'cop' - ie the way the spun fiber was wound around the spindle. The key is to maintain what I can only think of as it's centre of gravity so as to prevent it becoming unbalanced, and this is done by winding the spun yarn close to the whorl, gradually tapering along the shaft. With the 'Park & Draft" technique sussed, I was able to focus exclusively on drafting, and this clear video from A Yarn Loving Mama was really helpful. Allowing just a little practice each day, the 'thick and thin' spinning soon started to even out, becoming almost automatic and within a couple of days I was only 'parking' the spindle to join new fiber, and not after every few inches as before. As each day passes, various nuances are becoming clearer - like the way the spun yarn starts to feel different to the finger tips just before the spindle starts to turn back on itself. It's as if all the pieces of the puzzle are starting to come together. Definitely worth the effort. My technique is very far from perfect and must look quite comical - I start off sitting, and then find myself standing with arms outstretched to delay stopping to wind the yarn on. As suspected, spinning is very addictive ("just one more strip of roving") and actually rather meditative. A few people have asked when I'm going to get a spinning wheel - there is an air of inevitability in the question, as if spindles are merely a stepping stone to 'proper' spinning. The answer is that I might well try a wheel at some point in the future, but right now I am absolutely loving the 'hands on' nature of using a spindle and have no plans to switch. I hope you all have a lovely weekend. I'll be back next week with more knitting, some stitching and perhaps just a little spinning. 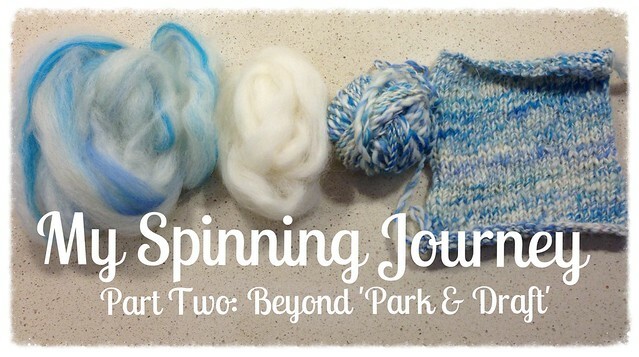 See also: My Spinning Journey (Part One) and Experimentation & Learning for more useful links. Good on you for sticking with it! I have not been bitten by the bug to spin, but I so admire those who do--I am still mastering 2 pointy sticks and a ball of yarn! I've been spinning for about 8 years now and teach spinning workshops regularly, and I still love my spindles. I use them about as much as I do my wheels. Good luck with your spinning endeavours; your swatch looks great! Can I ask, do you divide your roving into strips(aka pencil roving) like Megan LaCore demonstrates or do you spin from the whole thing like A Yarn Loving Mama? I'm very impressed by the thin-ness of your yarn- mine is still chunky and thin/thick! Great question! I started off with splitting it into thinner pencil strips, but that's still not thin enough for the yarn I want, so now I am splitting it into thicker strips (maybe 20 - 25% of the whole thing) and then drafting it out as I go like AYLM. Hope that helps? Yes, that is a great help, I'm inclined to think that trying to spin from thin strips makes things less controllable! Must buy some more roving to keep practicing!